Bread, milk and cookies? Really? 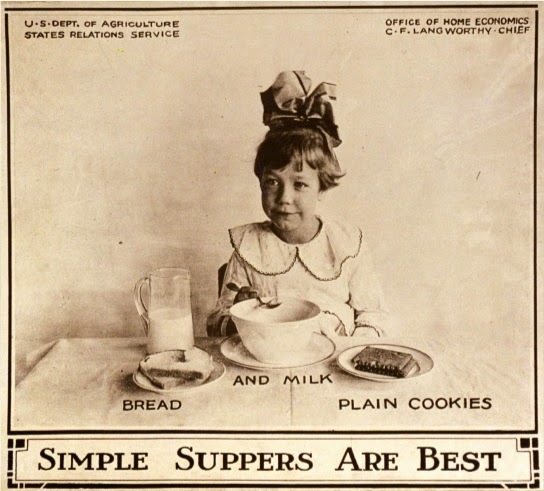 The poster above was published by the United States Department of Agriculture (USDA) in 1919, the same friendly folks who have since given us the Four Food Groups, the Food Pyramid and, now, some weird thing called MyPlate.The whole ideas was to make sure kids consumed enough calories to put in a good day's work at the factory. 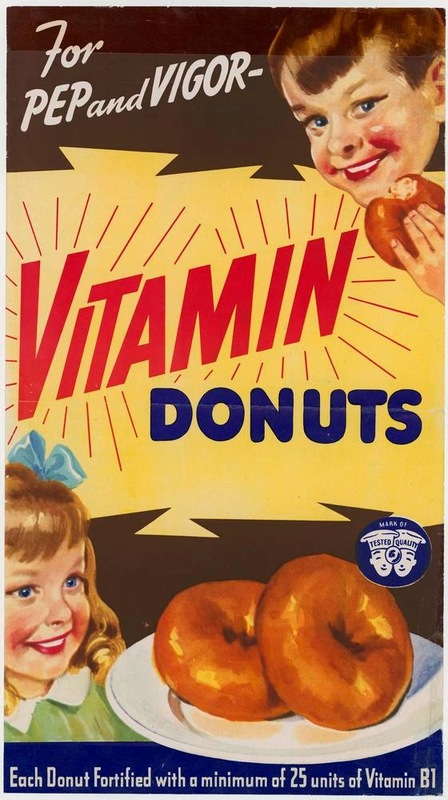 A couple of decades later the feds starting touting Vitamin Donuts after determining that people were not getting enough thiamine a.k.a. vitamin B1. So manufacturers patriotically added this deficient vitamin to a bunch of random foods like donuts, kind of like the vitamin enriched Pop Tarts and Froot Loops of today. Surely this poster had to be designed by one of the bureaucrat's kids let loose in some historic version of Take Your Daughter to Work Day. 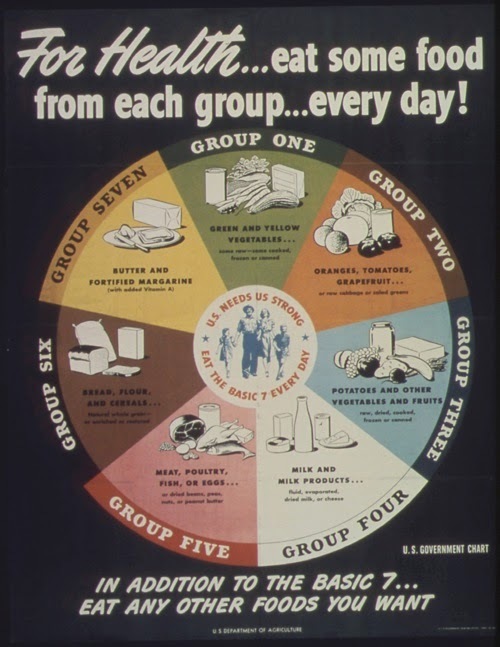 And did you know that before there were four food groups, there were seven? And butter and margarine comprised one of them? Paula Deen's grandma must have been on that committee. I kind of like the advice, "In addition to the basic 7, eat any other foods you want." Like maybe some vitamin donuts? In the past decade, critics of the government's nutrition advice have exposed all the faulty studies, political corruption and other hidden agendas that culminate in the feds' official advice on what Americans should eat. 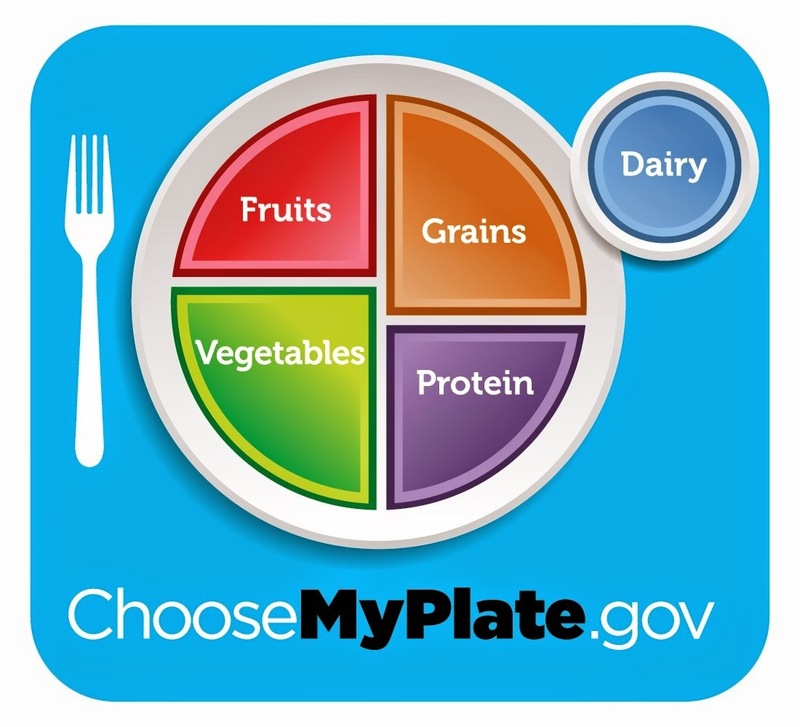 In MyPlate, for instance, corn and broccoli both belong in the vegetable quadrant, though they have remarkable different effects on insulin metabolism. So you could theoretically serve your family the proper proportions of french fried potatoes, bananas, wheat bread and glazed ham for dinner and think you did them a big favor. I recently started reading "Death by Food Pyramid: How Shoddy Science, Sketchy Politics and Shady Special Interests Have Ruined Our Health" by Denise Minger and am thoroughly enjoying her skewering of government's role in determining what we should eat. For instance, the decision to overload the old food pyramid with carbs had more to do with the government cheaping out on free school lunches than concern for our health. All I'm saying is the government may be good at building highways, but when it comes to our diets, the feds should mind their own business and stick to monitoring our cell phone conversations.